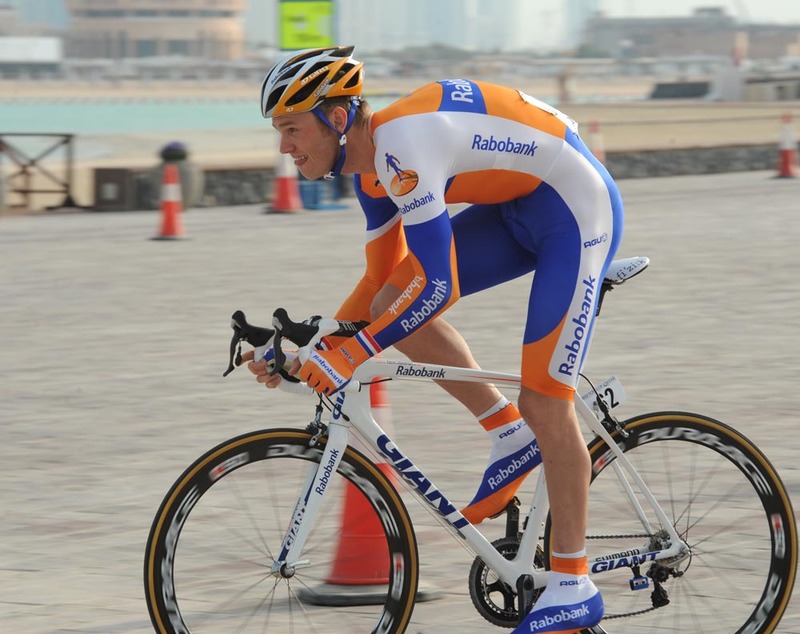 Dutchman Lars Boom (Rabobank) took a committed win in the short opening prologue time trial of the 2011 Tour of Qatar on Sunday. Britain’s Alex Dowsett made an impressive debut for Team Sky in fifth. Former cyclo-cross world champion Boom leapt from the starting block at full gas, obviously aiming to place highly on the 2.5-kilometre course and live up to being one of the pre-stage favourites. He used his bike handling skills honed from his ‘cross career to provide a masterclass in cornering on the tricky course. Time trial world champion Fabian Cancellara made his first outing for the new Leopard-Trek squad but couldn’t beat Boom’s blistering time, coming home second fastest four seconds adrift of the Dutchman. Any riders hoping for an easy start to their racing year will have been presented with a shock. The tight circuit around the Doha Cultural Village featured 11 corners, gusty winds and a sandy, cobbled surface. To add to the fun, race rules stipulated that all riders must use their regular road bikes rather than time trial-specific machines. Second from last off, Mark Cavendish (HTC-Highroad) ended up on the floor having fallen victim to the course. Although he got back on and finished the stage, it’s another unfortunate set-back for Cavendish, who is still sporting scars from a serious crash at the the Tour Down Under in January. Sky’s Juan Antonio Flecha put down the early marker, eventually finishing fourth. Team-mate Alex Dowsett made a solid debut in Sky colours, finishing just behind Flecha in fifth and six seconds behind Boom. It was an impressive start for 22-year-old Dowsett in his first race in the senior ranks proper having switched from the Trek-Livestrong development squad to Sky for 2011. Like many riders mindful of the long season ahead, British time trial champion Bradley Wiggins (Sky) played it cautiously to come in 29th, 13 seconds down on Boom. Russell Downing (Sky) placed well in 22nd, a good position for an assault on the overall classification later this week. On Monday, the riders face the first road stage of the 2011 Tour of Qatar – a 145.5km trip from Dukhan to Al Khor Corniche. The six-day race concludes on Friday, February 11.